The Thunder had their first home game of the 2015-2016 season against division rival Robert Morris University, losing by a score of 9-4. However, there were positives to take away from the game, as Wheaton was only trailing 3-2 going into the third period, outscored RMU 1-0 in the second period, and the offense exploded for 4 goals and 30 shots on goal. They will look to get back to a .500 winning record against RMU once again tonight, at 9:20 at Center Ice of DuPage. The Thunder hockey team opened up their season this past weekend, splitting a pair of games with the home team, Southern Illinois University-Edwards. Wheaton won by forfeit on Friday after a long drive down to Southern Illinois, as a miscommunication caused the refs to not show up. The next day, after breakfast and some time spent doing work, resting, or exploring the city of St. Louis, Wheaton again arrived at the rink, and this time played a determined effort, unfortunately ending up on the short end of a 7-0 score. The Thunder will look to bounce back next weekend, as they take on Robert Morris University in their home opener Friday and Saturday night, 8:40 and 9:20 PM respectively, at Center Ice of DuPage. Ladies and gentlemen of all ages, be you a bright eyed Freshman or a seasoned grad student, come try hockey and see if its the sport for you! 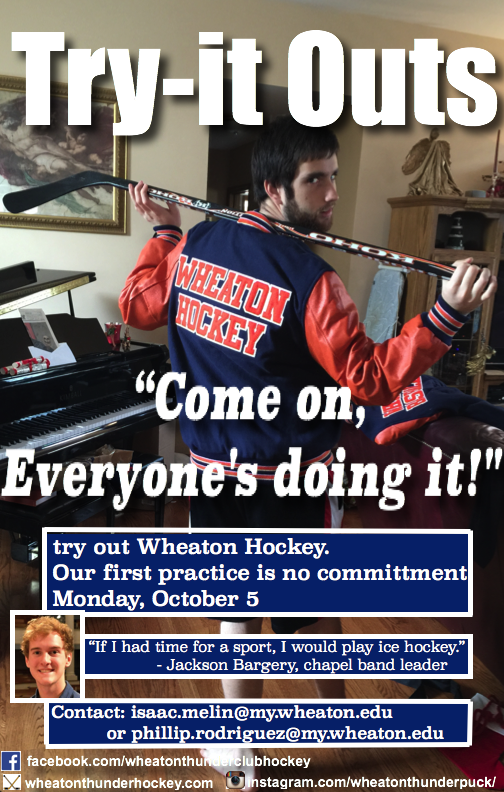 This Monday, October 5th, the Wheaton Thunder Club Hockey Team will be hosting a “Try-It Out” for all you fence sitters who know how cool hockey is, but aren’t quite sure if its meant for you. We will be hitting the ice at 10:00 PM at Center Ice of Dupage. Come try it out if you’re curious. Also, we will be christening the new players to their very first on ice practice. We look forward to seeing Ted, Zach, Tommy, Caleb, and all of you people who want to give it a try, on Monday! The Wheaton Thunder Hockey team went to Evanston, IL on Friday night for a preseason game against the Northwestern Wildcats. Despite being on the short end of the score, the Thunder came away with several positives for the year that they hope to build on over the coming weeks, leading up to the start of the regular season. Wheaton Hockey will play next on their season opener on Friday, October 23rd against SIUE, and will have their home opener on Friday, October 30th against Robert Morris University. The home opener will be at Center Ice of Dupage and puck drop will be at 8:40.